ar faded from the nightly news broadcasts of network television, Nicaragua is about to make its return to prime-time TV in the United States. Only this time, the story is much more positive. Starting July 15, the Emmy award-winning reality TV series Survivor will start filming its 21st season in various remote areas around San Juan del Sur. For 14 weeks on prime time summer television, an average of 13 million U.S. households will tune into CBS every Wednesday night to watch 20 contestants compete for the $1 million grand prize on Survivor Nicaragua. The program, which will be rebroadcast in 154 countries, is expected to single-handedly do more to change Nicaragua's international image than any other effort over the past three decades. “All of a sudden the spotlight is going to be on Nicaragua, and it's going to make people stop and think and take a closer look at the country. So that will be a good thing,” Leisa Francis, co-executive producer of Survivor, told The Nica Times. “I have goose bumps,” added San Juan del Sur Mayor Jorge Sánchez. The tourism minister and the mayor and everyone else involved in the project have every reason to be excited. The 250-member crew of Survivor will inject more than $6 million into the local San Juan economy over the next six months, contracting some 200 locals and renting the equivalent of 20,000 hotel room nights in this small town. Following on the economic crisis of the past two years, Survivor will feel like manna from heaven in San Juan del Sur. And that's before the potential tourism boom that the show is expected to bring to town after it features San Juan del Sur's lush forests, exotic wildlife and inviting culture for the next three months on U.S. TV sets. For a country with a paltry $2 million annual budget for tourism promotion, Survivor will be like Nicaragua winning the progressive jackpot with only three coins in its pocket. “We don't have the resources to even pay one TV ad that would reach that kind of audience,” said Javier Chamorro, executive director of investment promotion agency ProNicaragua. The production value of the show is also better than any promotional effort that the government has ever put together. Not only will the whole season be shot in high-definition, but it will also be a much more subtle, and probably more effective, sell than the loud government ad campaigns. Every country where Survivor has been filmed since 2000 has asked the program to come back, Francis said. But now it's Nicaragua's turn for the next two seasons, both of which will be shot over the next year. And the crew doesn't seem to mind if they stay longer than that. 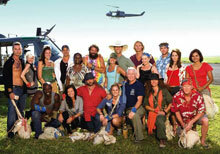 Considered the most popular unscripted TV drama of all time, Survivor is considered the granddaddy of the U.S. reality television craze that started in 2000. Airing two seasons a year, the show has continued to dominate the U.S. TV ratings since its first season, even managing to set new viewing records last season. The show places 20 contestants in a desolate and foreign wilderness location, and has them compete against one another in a series of “tribal challenges” that are supposed to reflect the culture and reality of the host country. Each week contestants vote others in their group off the program, until there is one winner left. Since the show started, Survivor has spawned its own reality TV celebrity culture, oftentimes bringing back popular previous contestants. While the show has developed a loyal following, it's also produced a subculture of “spoilers” – fans who try to appear on the set or find out what's happening before it airs to blog about it or sell photos. So security and secrecy are a big part of the game. In addition to coordinating with National Police, the Survivor production crew will have its own private security force as well as hired locals. The production team is also being very careful with the Survivor Nicaragua logo, to avoid pirated merchandise. ProNicaragua's Chamorro said he told the Survivor people that pirating of their logo is a given in Nicaragua, so they should expect to see “Survivor Nicaragua ” t-shirts for sale in San Juan within days of rolling the cameras. Nicaragua being selected for the next season of Survivor did not happen by chance, but thanks to a coordinated lobbying effort by the Sandinista government and ProNicaragua. The producers said the decision was between Nicaragua and several other countries, but they liked what they saw here, both in terms of the country's potential for filming and the support received from the government. That decision is a major vote of confidence for Nicaragua. Survivor was also given a series of sweeteners by the government. In addition to fiscal incentives under the Tourism Investment Law (Law 306), the Nicaraguan government also had to provide assurances of road maintenance so the crew can access the area's remote beaches during the rainy season. The government has agreed to provide road grading-machines to keep the access open to the filming locations. ProNicaragua's Chamorro says that Nicaragua's incentives, security and geographical location could help make this country a new hotspot for the film industry – especially if all goes well with Survivor. Since the old Tarzan movies of the 1940s, Hollywood has looked mostly to Mexico for many tropical jungle shots. But as Mexico becomes increasingly dangerous, production crews are looking elsewhere for similar conditions – and Nicaragua wants to claim that role. “If we do a good job here, with companies like CBS and Mark Burnett Productions, we are going to be in good shape because they can speak well of Nicaragua with other producers, and their opinions are important,” Chamorro said. Even without their recommendations, Nicaragua is already gaining ground in the film industry. The Italian version of celebrity Survivor, L'Isola dei Famosi, wrapped on Corn Island last month (NT, March 12), and the Spanish version of the program started shooting in the same Caribbean area two weeks ago. And in Managua, Nicaraguans are still buzzing about the recent release of La Yuma, the first feature-length movie shot and produced here. The critically acclaimed film is still playing in Nicaraguan theaters. Minister Salinas said a Dutch TV program is also coming to Nicaragua to film its next season here, making it the fourth international reality TV program to film here in 2010. That announcement will be made in the coming weeks. But in terms of boosting tourism in Nicaragua's single most important market, nothing will have an impact as big as Survivor. But if Survivor Nicaragua is as successful as people hope, it could just finally help change the lingering misperception that Joe Gringo has about Nicaragua.